Your roof must not leak because you mounted solar panels on it! Your roof must not leak because you mounted solar panels on it! — Wavetra Energy LTD. Your roof must not leak because you mounted solar panels on it! I have decided to put up this post about roof leaking due to solar panel installation, because of the several customer concerns we have got before we start installation. 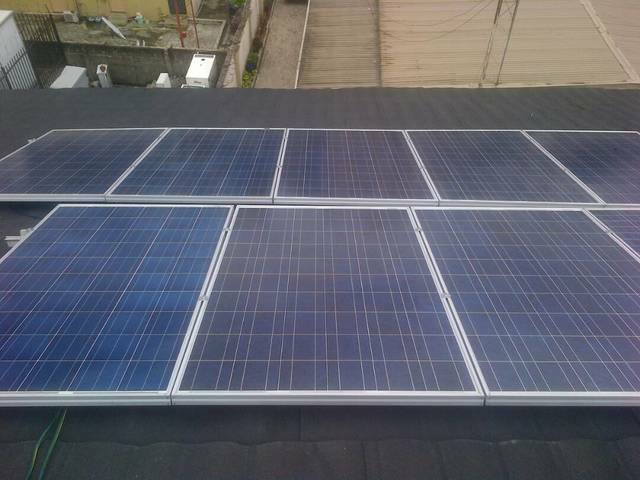 It’s remarkable because almost every installation we do at Wavetra Energy LTD in a month across Nigeria, say 70% percent of the time each month, clients raise the question of what will happen to their roof after drilling. Of course the installation of PVs on roof involves some sort of drilling in order to mount the solar panels securely on the roof. Of all times, we have never got a case of the roof leaking after installation. Of course this is where you see the need for an experienced and a proactive solar installation company – a company that not only pay attention to every detail of the work but also knows what could possibly go wrong and thereby acts to prevent it. Your solar panel installation company must be experienced. But this doesn’t mean opportunities shouldn’t be given to new entrants in the market and that’s why we put up this blog post and other articles to share knowledge. First of all not all aluminum attachments and profile cabinet is adequate for solar panel installation. You will need specially made solar profiles (thicker aluminum) and attachments to firmly hold the solar panels and avoid its displacement in the future say after 5 years or more. Your solar panel installation, depending on the quality of panels you got should last beyond ten years. Panels got from Wavetra Energy LTD has a 25 years life span. So your installer must pay every attention not to overlook any detail during the installation considering the long time it supposedly will stay on your roof generating free electrical power! 25 years is like from 1980 to 2005! Or from 2017 to 2042!!! Now you can picture the length of time. At Wavetra Energy, we maintain that installation must not be done on very old roofs until they are either repaired or replaced. We take it very seriously and we think every solar company in Nigeria should. Our installation comes with warranty and any damage as a result of old roof might be considered our error so that’s why the customer needs to know and possibly sign undertaking if such installation must be done at all. Many customers wants an instant quotation on solar panel and Inverter system installation. It is not bad to give out this quote even without survey but they also have to understand that your quotation might change after you survey the site and the roof. It is after this survey that you will now inform the customer the nature of his roof. There is usually no problem with most roofs but you might encounter very bad and old roofs in ancient cities or in rural communities. It is worthy of note that solar panels on your roof helps protect your roof shingle from degradation as result of direct UV impact over a long period of time. Also your roof will never leak when the installation is carefully done. Like I said before, we have not got any roof-leaking case before. You must note that by nature, water falls off slanted materials like your roof. Your solar panel doesn’t have a moving part so rain falls on it and proceed to the channeled drainage. We recommend that panels be installed on 20 degrees or 30 degrees direction. Your installation company must be skilled on how to effectively use sealants and flashing to further prevent any opening and possible leak path. Hope this post helps.